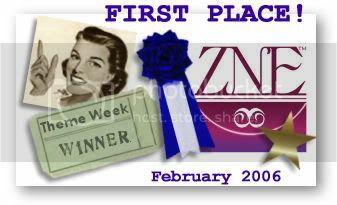 Here is the lovely trophy I won for the ZNE contest "Waiting for Spring"
HUH?? why would I be thanked?!? DUH! Not the only Chel in the world! :) Very nice blog! I love your stuff it's so moody and lovely! Bella dear, so glad you get to have fun with your WELL deserved trophy. - Another Chel, the one who was happy to hand you the award!